Did you have a good holiday weekend, friends? I hope the answer is yes, whether you shared the day with friends, family, and a turkey feast or spent it solo in your pajamas watching movies you love. In case you’re as over Thanksgiving leftovers as I am, today I’m re-visiting one of my FAVORITE cold-weather soups. 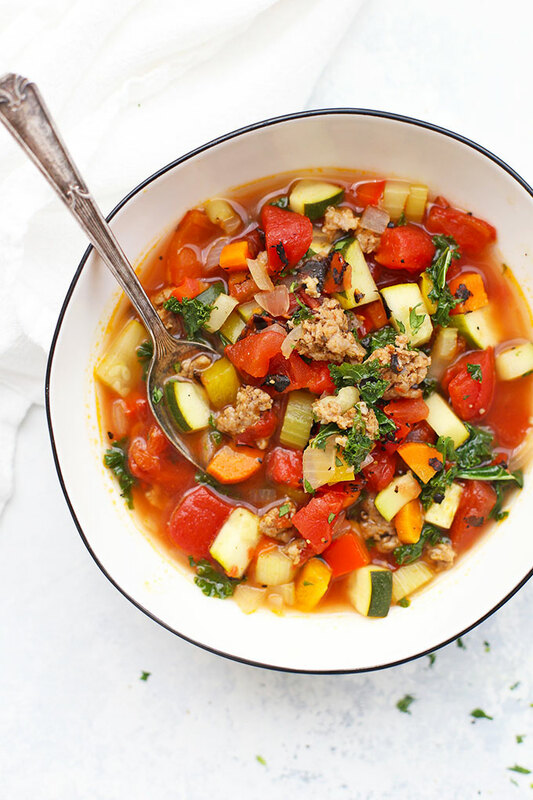 This Sausage Vegetable Soup is just right for this week. It’s packed with veggies, loaded with color, and promises to deliver with big flavor. BIG colors = veggie packed! 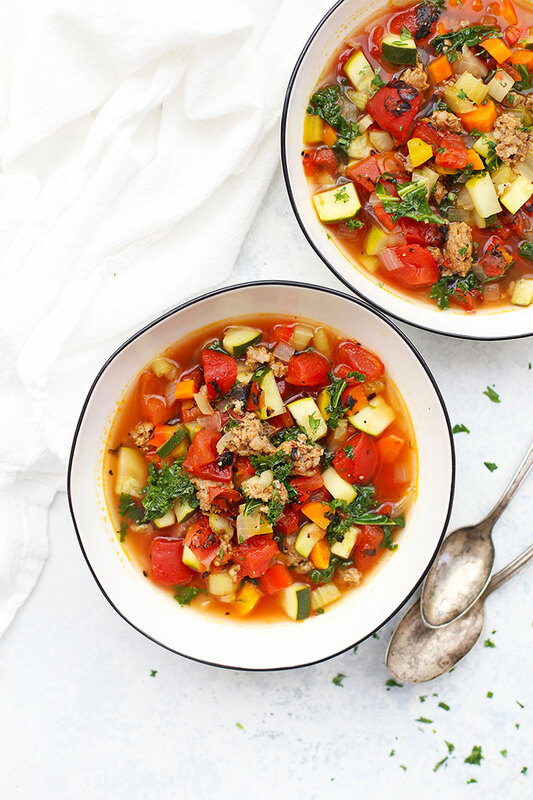 First off, any time you get a chance to eat the nature-made rainbow, you’re doing GOOD things for your body, and this sausage and vegetable soup definitely delivers on the veggies. 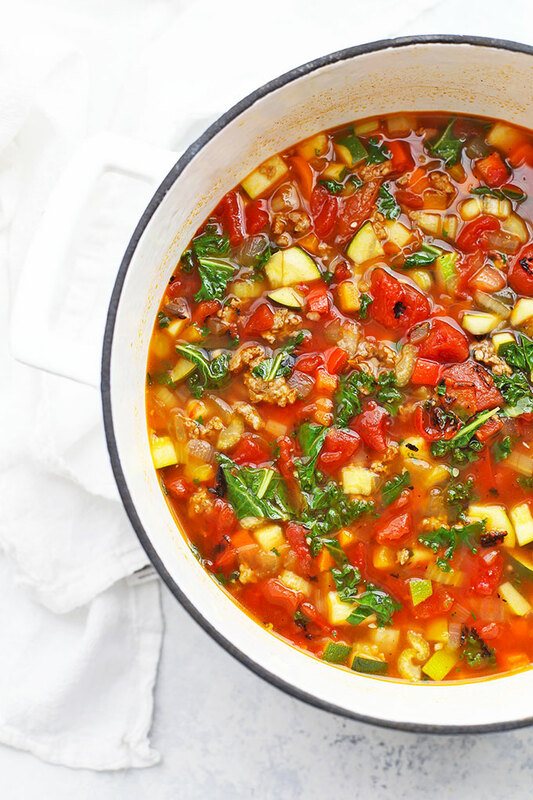 From the brights reds of the tomatoes, to the yellows and oranges you can bring in through the peppers and carrots, to the greens from zucchini and kale, this soup definitely feels (and looks) amazing. An easy way to eat more greens – Next, let’s talk about the kalephant in the room. See what I did there? Because kale. It’s in this soup. Do you love it? Try to put it in everything? Aren’t a fan? Think it’s all hype? 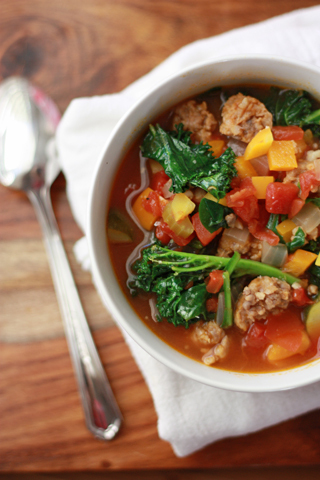 Whatever team you side with at camp kale, consider trying it in this soup. Kale holds up remarkably well without feeling like a super soggy mess. If you aren’t sure about it, feel free to start at the low end (1/2 bunch) and work your way up over time. REALLY not sure you can handle the kale? Skip it or swap it for baby spinach. The flavor gets better with time. 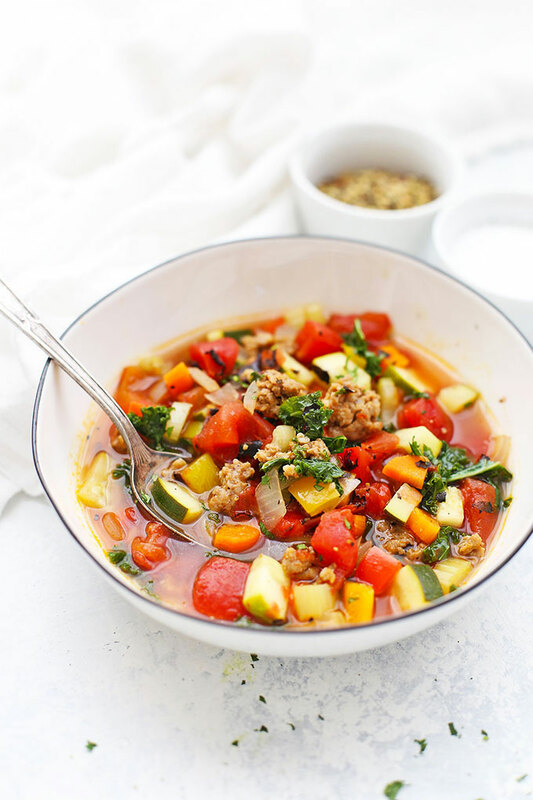 All those veggies bring their own yummy blend of flavors, and everything is tied together with a little bit of sausage to flavor the whole soup. 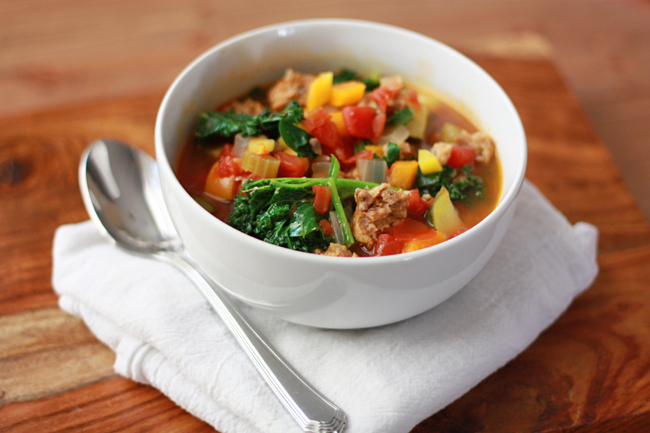 Then, as the soup simmers, the flavors blend and meld together and the end result is delicious. The flavor only develops more with time, so I often make this in the morning when I plan to eat it at night, or I make it at night for the next day. So good! You can mix & match goodies. 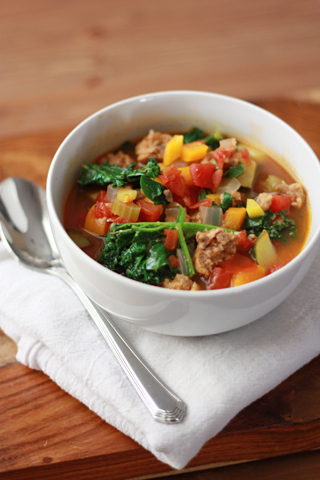 Next time you need to clean out your crisper drawer, consider this sausage and vegetable soup! It’s easy to use up different veggies you have going on in the fridge here. Feel free to toss in a diced potato, yellow or butternut squash, different bell peppers, or some extra carrots. The more the merrier! Let’s Talk Sausage. (You’re The Boss of Flavor!) 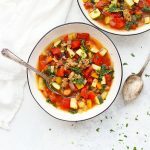 I’ve made this sausage vegetable soup with ALL kinds of different sausage over the years–ground chicken or pork Italian sausage, sliced pre-cooked Italian chicken sausages, spicy andouille, and even mango jalapeño Aidell’s sausages once. Use your favorite. A little really does go a long way here, keeping the soup light while still packing a powerful flavor punch. Swap the Veggies. 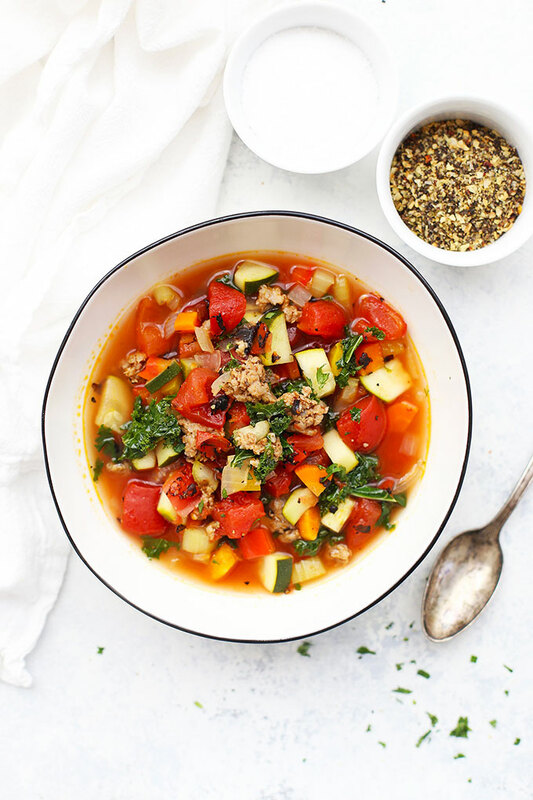 If my veggie combination isn’t your jam, feel free to use what you have on hand to fill this sausage vegetable soup out a bit. You can add in more carrots, or some diced mushrooms, or that one potato you’ve been meaning to use. It’s allll good! An Extra Protein Boost. collagenI often stir in a few scoops of to this soup, along with the broth. It dissolves in cold or hot liquids, and you can’t taste it at all in soup. It’s an easy way to sneak in some extra protein! As always, if you have time, make this soup the night or morning before you plan on eating it to allow the flavors to blend. It gets so much better with time! In a large soup pot or Dutch oven, brown sausage over medium heat. Add onion, bell peppers, carrots, celery, and cook 3-5 minutes, or until crisp tender. Next, add the zucchini and cook 1-2 minutes more. Add garlic and cook 1 minute. Add tomatoes and vegetable broth. Cover the soup, bring to a boil over medium heat and reduce heat to low. Simmer 20-30 minutes, or until veggies are tender. Add kale and stir to wilt. Recipe originally posted Feb 2014. Re-tested, rephotographed, and video added Nov 2018. Im currently ‘freezing’ with sunny skies and temperatures all the way down in the fifties. 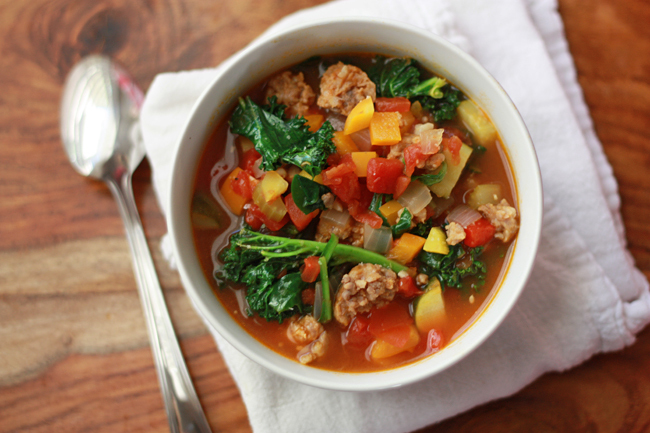 This soup sounds like just the ticket! Oh! I’m in the kale camp. It completes my life. I’ve even won my kids over to it(!) We like lacinato aka black kale. Its not as tough and is so good in soup. Sometimes I freeze it and then crumple it into a smoothie. My two favourite salads are here: [ http://www.marthastewart.com/870064/lacinato-kale-salad-roasted-squash ] and here: [ http://pinchofyum.com/pomegranate-kale-wild-rice-salad-with-walnuts-feta ]. Thank you for another kale recipe. Jessica – I’d say 4-5 servings. Not a huge batch. Hope that helps! Has anyone added rice to this soup? Would you add it precooked toward the end, or increase the liquid and cook it in the soup? Can this be done in a slow cooker ? If so, how long ? 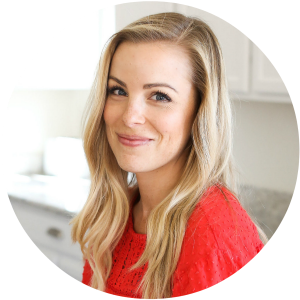 Stacey – I haven’t done it in a slow cooker before, but I’m sure it’d work. If I had to estimate, I’d say you could probably toss everything in and set it for about 3 hrs on HIGH, then break up the sausage at the end. Or, you could brown the sausage beforehand, and cook it about 2 hrs on HIGH or so. Olive oil, salt, and pepper are listed in the ingredient list, but not the quantities, nor is it stated in the recipe as to when to use them. I’m guessing you might have used the oil to saute the sausage but that isn’t always the case, especially in a non-stick pan so I thought I should check. Please advise about if these things are needed, and if so, how much and when, and also if they are included in the nutritional summary. Thank you!! Jodi – I’m so sorry for the confusion! I updated the old recipe and forgot to remove olive oil from the ingredient list (I no longer use it to brown the sausage). I didn’t include additional salt, pepper, or olive oil in the nutrition facts. Salt and pepper are added to taste, so I didn’t give specific amounts. (If your broth or tomatoes have added salt, you may not need any, for instance). Can I use cabbage instead of kale? Memebera of my family are not huge kale lovers. Any idea how to covert this for the instapot?